Please read the following information carefully, as it is intended to help you make the most of your tour. To avoid disappointment do not expect the same comfort or service facilities as you would find in Britain. Our holidays are not designed for “tourists” but for diving enthusiasts with an adventurous spirit – no whingers please! The following booking conditions and information form the basis of your contract with Oonasdivers Limited (“the Company”). Your contract will be with the Company. Your contract with the Company is made once the Company has received the specified deposit and the Company has signified, in writing, its acceptance of the booking and you have been sent written confirmation by the Company. These terms and conditions will form the entire terms of the contract between the Company and the lead name, who will be deemed to be acting for and on behalf of all other persons named on the booking. The deposit or full balance payment will constitute acceptance of these conditions by all the clients and the parties named on it and as confirmation that the lead client has authority to act on behalf of all other persons named on the booking. If you have any special requests outside the services offered in the brochure or on the website, the Company will endeavour to assist but is not obliged to do so. These must be notified to the Company in writing before booking. After booking they will be treated as an alteration and a charge made (see below). Any additional costs of a special request must be borne by you. When you buy an ATOL protected flight or flight inclusive holiday from us you will receive an ATOL Certificate. This lists what is financially protected, where you can get information on what this means for you and who to contact if things go wrong." “We, or the suppliers identified on your ATOL Certificate, will provide you with the services listed on the ATOL Certificate (or a suitable alternative). In some cases, where neither we nor the supplier are able to do so for reasons of insolvency, an alternative ATOL holder may provide you with the services you have bought or a suitable alternative (at no extra cost to you). You agree to accept that in those circumstances the alternative ATOL holder will perform those obligations and you agree to pay any money outstanding to be paid by you under your contract to that alternative ATOL holder. However, you also agree that in some cases it will not be possible to appoint an alternative ATOL holder, in which case you will be entitled to make a claim under the ATOL scheme (or your credit card issuer where applicable).” “If we, or the suppliers identified on your ATOL certificate, are unable to provide the services listed (or a suitable alternative, through an alternative ATOL holder or otherwise) for reasons of insolvency, the Trustees of the Air Travel Trust may make a payment to (or confer a benefit on) you under the ATOL scheme. You agree that in return for such a payment or benefit you assign absolutely to those Trustees any claims which you have or may have arising out of or relating to the non-provision of the services, including any claim against us, the travel agent (or your credit card issuer where applicable). You also agree that any such claims may be re-assigned to another body, if that other body has paid sums you have claimed under the ATOL scheme.” For further information, visit the ATOL website at www.atol.org.uk. ATOL Protection does not apply to all holiday and travel services on our website. Please ask us to confirm what protection may apply to your booking. Not all holiday or travel services offered and sold by us will be protected by the ATOL Scheme. Please ask us to confirm what protection may apply to your booking. (1) The specified deposit is due on booking. (2) The balance of the holiday cost as set out on the Company’s confirmatory invoice to you must be paid to the Company not later than 12 weeks prior to the date of departure unless otherwise stated. Failure to do so will result in the booking being treated as cancelled by you. Cancellation charges will be payable as set out in Clause 5. (3) In the case of bookings made less than 12 weeks before the departure date, payment must be made in full upon booking. (4) Money paid to a travel agent for a holiday arranged by the Company is immediately held by that agent as agent for the Company. After a booking has been made the Company reserves the right to alter the price as a result of UK or foreign government action (including changes in the rate of VAT and any other duties or levies), currency fluctuations or increases in transportation costs. If the alteration results in an increase of more than 15% of the original price quoted, you may cancel the booking and obtain a full refund. In the event of an increase, an amended invoice will be sent to you which is payable within 7 days. If you wish to cancel, you must also notify us in writing within 7 days. The Company will absorb an amount equivalent to 2% of the holiday price and only an amount in excess of this 2% will be passed on to you. No increase will be made within 30 days of departure. In the event that the holiday you have bought is subsequently sold or offered for sale at a lower price than you paid, we will be under no obligation to refund the difference in the price. If the Government imposes a levy for the purposes of consumer protection, we reserve the right to pass this charge on to you. If the flight company imposes a fuel levy, we reserve the right to pass this charge on to you. Flights from regional airports will be regarded as ‘non-standard’ tours and a supplement may be charged. If you make a direct payment from your bank to ours then you will be responsible for any charges made by the banks concerned. The prices on our website have been calculated against costs as known on 1st July 2014 at an exchange rate of US Dollar $1.52 and Euro rate €1.14 to £1 Sterling. Please refer to our website for any updates. Please note that travel services are not always purchased in local currency and some apparent changes have no impact on the price of your travel due to contractual and other protection in place. The information about the tours featured in the brochure or on the website is given in good faith and believed to be accurate at the time of publication. However, the Company reserves the right to make any necessary changes to the tours described in the brochure. It may also prove necessary for the Company to vary or modify a tour itinerary or its contents due to local prevailing conditions. You agree to such necessary variations or modifications being made and also agree to be bound by the decision of the tour leader or representative appointed by the Company. In such circumstances the Company reserves the right to substitute alternative arrangements. If you cancel your holiday after the Company has sent out travel documents, no refund (if due) will be made until all such documents are received back by the Company. In certain circumstances, you may be able to recover cancellation charges under your travel insurance policy. It is vitally important that your passenger details or requirements are accurate. When the booking has been accepted by the Company, you wish to make any alterations to the booking details, e.g. change of name, date, accommodation, departure airport, duration etc., the Company will do all it can to assist you although it is under no obligation to make any alterations other than to allow you or any member of your party who is prevented from travelling to transfer his/her booking to someone else, provided that written notice is given to the Company not less than 35 days before the departure date with full details of the transfer. The transferee(s) must satisfy all the requirements for a diving holiday as set out in these terms and conditions and the brochure or our website. Any additional costs for such a transfer of booking must be paid by you or the transferee(s). You will be required to pay any additional costs arising from your alteration such as additional flight costs. However, any alterations made by you less than 8 weeks prior to departure may be treated at the company’s discretion as a cancellation and the charges set out in Clause 5 above will apply. You are entirely responsible for ensuring the accuracy of your passenger details submitted to us. Any changes to the passenger information will carry an administrative charge. Any changes you wish to make to your holiday arrangements once your holiday has commenced are your sole responsibility. The Company will not be responsible for the additional cost of any changes you make whilst on holiday and these must be paid for by you. Some travel arrangements may not be changeable after reservation has been made and any alteration request could incur a cancellation charge of up to 100% of that part of the arrangements at any time after booking. No refund or compensation is payable by the Company for any unused accommodation, diving, flight, services or features provided during the holiday. Clients, who do not complete a diving course for any reason whatsoever, cannot be refunded for a portion or the remainder of the diving course. The Company hopes not to make any changes in your travel arrangements, but as these are made many months in advance of your holiday, it is possible that we may have to make changes and reserve the right to do so at any time. Many changes will be minor and will have no effect on your holiday, but the company will advise you or your travel agent as soon as possible. No compensation is payable for minor changes. We also reserve the right in any circumstances to cancel your travel arrangements but will not do so less than 30 days before departure, except for reasons of force majeure (see below) or your failure to pay the final balance. If the Company is unable to provide the travel arrangements you have booked, you can either have a refund of all monies paid or accept an offer of alternative travel arrangements of a comparable standard if available. With the exception of liveaboards when the minimum numbers are not reached and no alternative liveaboard is available, a suitable land based tour will be provided. The company will refund any price difference if the alternative is of lower value. Please note that carriers and types of aircraft used may be subject to change, which is deemed to be minor. Other minor changes include (but are not limited to) changes of flight times by less than 12 hours and change to accommodation of the same standard. If the company makes a major change to your holiday, we will inform you or your travel agent as soon as possible if there is time to do so prior to your departure. You will have the choice of either accepting the change in arrangements, accepting an offer of suitable alternative travel arrangements from the company (with a refund of any price difference if of lower value) or cancelling your booked holiday. (1) Our obligation and those of any suppliers providing any service or facility in any part of your holiday are to take reasonable skill and care for the provision of such services or facilities. You must show reasonable care and skill that has not been used if you wish to make any claim. (2) The Company accepts liability for any loss you may suffer if any part of the holiday arrangements you book with the Company are not as described and not of a reasonable standard. The Company also accepts liability if you suffer death or personal injury as a result of the holiday arrangements failing to be as described and of a reasonable standard, subject to the following terms. These acceptances of liability do not apply if there has been no fault on the Company’s part nor on the part of the Company’s suppliers and the loss, death or personal injury suffered is attributable to your own acts or omissions, the acts or omissions of a third party not involved in providing the services which make up your holiday, which were unforeseeable or unavoidable, or were due to unusual or unforeseeable circumstances whose consequences could not have been avoided or anticipated even with all due care or to an event which, even with all due care, could not have been foreseen or forestalled. They are also conditional upon you assigning to the Company any rights you may have against any other person whose acts or omissions have given rise to the Company’s liability. (3) Optional extras do not form part of the tour or contract. It is understood and accepted by the guest that any assistance given by the tour leader or representative in arranging optional extras does not render the Company liable for optional extras. Accordingly, the Client hereby releases the Company from all claims and causes of action arising from any damages, loss of enjoyment, inconvenience, or injuries related to the quality of such products. Amongst others, optional extras include extra dives, sightseeing, watersports and other extras that are not included in the tour price. (4) The Company’s liability to compensate you and the amount of such compensation is subject to the following limitations. First, in the case of damage other than death, illness or personal injury, compensation is restricted to a reasonable amount having regard to such factors as the holiday cost and the extent to which the enjoyment of your holiday can be said to have been affected. Second, in all cases, liability to you and compensation payable to you may be restricted in accordance with the provisions of all International Conventions relevant to the transportation, services and products and accommodation provided, the terms of which apply to and are incorporated into this contract and so limit the Company’s liability to you. (5) You must appreciate that in developing countries service in hotels, on tour and in restaurants cannot be expected to be of the same standard as those in the UK and the term “reasonable standard” must be interpreted accordingly. This is particularly important where “liveaboard dive boats” are involved in a tour and the clear limitations of being on such a small vessel must be accepted. (6) Diving activities carry inherent risks and each person wishing to participate in such activities may be asked by the supplier to sign liability releases and provide a current medical certificate and in all cases must adhere to the restrictions imposed by the supplier. (7) Refer to our website for any updates. The Company accepts no responsibility for and shall not be liable and will pay no compensation in respect of any loss or damage or alterations, delays or changes arising from, whether directly or indirectly, unusual and unforeseeable circumstances or threats of these beyond its control, such as war, or threat of war, riot, civil strife, industrial disputes including air traffic control disputes, terrorist activity, political unrest, change in government regulations, natural and nuclear disaster, floods, fire and adverse weather conditions, technical problems with transport, closure or congestion of airports or ports. You should understand that diving holidays can be especially susceptible to force majeure and its consequences, such as damage to equipment and diving environments. All transportation by air, land and sea is subject to the terms and conditions of carriage of the company providing the transport, some of which limit or exclude liability. Carriers’ terms and conditions are often the subject of international agreements, copies of which can be made available for inspection with advance notice at our offices. By its contract with you, the Company does not enter into an agreement for carriage by air, but only undertakes to reserve on your behalf accommodation on board an aircraft operated by one of the airlines selected by the company. Air travel, in particular, is subject to operational decisions by the carriers and airport authorities, which may result in delay or the aircraft being diverted, over which the company has no control. At the time of going to print we are unable to confirm the airline operators, carriers and aircraft type for our tours. Oonasdivers accepts no responsibility for any connecting flights you have booked or any separate travel arrangements you have made. Proof of diving qualification by a recognised agency is compulsory. Clients must submit their diving qualifications to the Divemaster before diving can commence. The decision of the Divemaster to accept these or not is final. All clients on the booking form participating in scuba diving must be in good health and not have any medical history of lung disorders, asthma, epilepsy, diabetic or recent surgery and agree to discontinue diving if respiratory congestion or a head cold or any other medical condition takes place during the holiday. If the client has any medical condition contrary to these requirements he/she must produce a diving medical certificate of fitness, prior to diving. Failure to provide satisfactory diving qualifications or medical certificates will not result in any liability whatsoever on the part of the Company. Optional extras do not form part of the tour or contract. It is understood and accepted by the Client that any assistance given by the tour leader or representative in arranging optional extras does not render the Company liable for optional extras. Accordingly, the Client hereby releases the Company from all claims and causes of action arising from any damages, loss of enjoyment, inconvenience, or injuries related to the quality of such products. Amongst others, optional extras include diving, excursions, sightseeing and other extras that are not included in the tour price. The Company has taken great care in choosing the diving schools and operators and makes every effort to ensure the highest standards of diving etiquette and safety. However, clients are advised that diving takes place at their own risk and they must behave in a fit and proper manner at all times, in accordance with all recognised diving practices and procedures and take proper responsibility for their own safety. Clients are advised that certain diving sites are very remote, either by distance or time or both, from a re-compression chamber. The Company reserves the right to require to withdraw from the holiday any person whose actions or conduct is considered by the Company or its representative in its absolute discretion to be incompatible with the comfort and safety of the company’s other clients or to be offensive to them. In the event of such conduct, no liability whatsoever will be owed to that person by the Company upon withdrawal from the holiday. The Company will advise you on what travel and health formalities may be required for your holiday. However, it is your responsibility to ensure that all necessary travel documents such as passports, visas and diving qualifications are obtained and are valid. If you have cause for complaint whilst on holiday, you must bring it to the attention of the on-site local representative or agent of the Company who will then do their best to rectify the situation. It is unreasonable to afford the Company or its representatives no opportunity to rectify any problem whilst on holiday and failure to do so on your part may affect your right to compensation. Should any problem remain unresolved, any complaint must be made in writing to the Company within 28 days of completion of the holiday. It is your responsibility to ensure that you have adequate insurance cover. It is a condition of booking your holiday that you have taken out adequate insurance against such risks as medical costs, personal accident risks, personal liability and legal expenses. You are especially advised to insure against cancellation and loss of deposit. 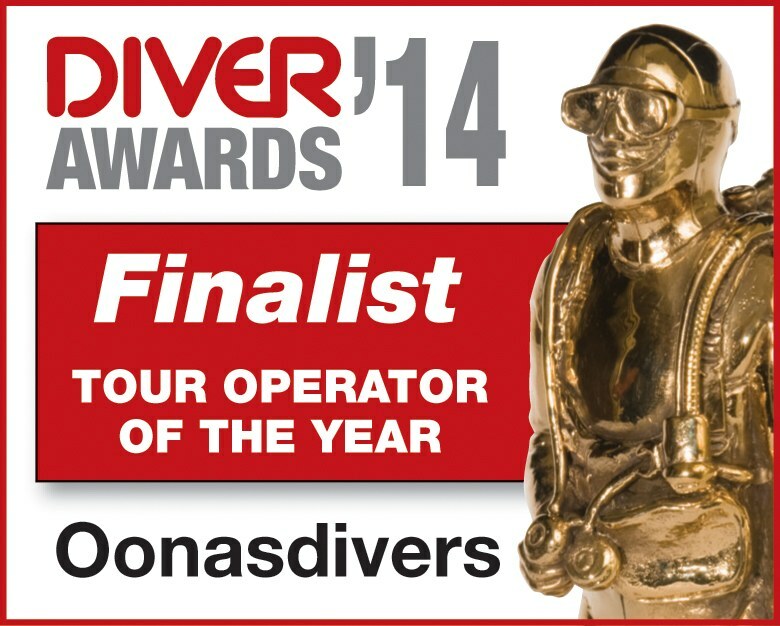 Oonasdivers link to Westfield Travel Insurance on their website which provides a scuba diving holiday policy. We reserve the right to accept a payment commission from Westfield. You are advised that standard holiday insurance does not cover scuba diving. You are required to ensure that your policy has an endorsement for scuba diving if you are undertaking it as part of your tour. Please note that in the event of cancellation, insurance premiums are non-refundable.